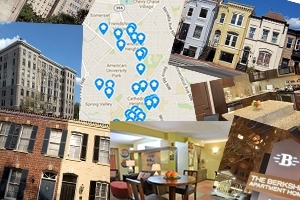 Apartments, row houses, English basements—from Washington, D.C., to Virginia and Maryland, AU students dwell in many places besides the campus’ residence halls. Moving off campus for the first time can be both exciting and daunting, an exciting milestone of sorts. With that in mind, AU provides students with a number of helpful tools, from an engaging, 1960s-era instructional video on being a good neighbor to a frequently updated online list of vetted housing options. “The resources AU offers our students really sets us apart from other universities in the area,” said Christina Medico, coordinator of off-campus and guest housing with AU’s Housing & Dining Programs. Her department hosts a new in-person orientation as well as a semesterly newsletter, both of which educate students on their rights and responsibilities as tenants in the D.C. community. Spring’s Off-Campus Housing Fair draws hundreds of students to meet dozens of area property representatives. Even still, it’s nice to get the inside scoop from students already living off campus on what that move is like and a few things to keep in mind for a smooth tenancy. “Transportation can get difficult, especially if you live far away. You have to either learn the bus schedule or train yourself to wake up earlier. . . . Don’t procrastinate because you don’t want to run to the library in the middle of the night to finish or print something,” said senior finance major Saida Khamidova. “Know your place in the community. You’re no longer a college student; you’re a resident living in the larger Washington, D.C., community. It’s important to let your neighbors know that though you are a college student, you are also their neighbor, you’ll be respectful, and you want to enjoy the community just as much as they do,” said SIS junior Zachary Cole. “When you went home to a dorm, you had everyone on your floor and you could go to different floors easily. When you go home to your roommate, you want to have a person that you enjoy being around because that’s the person you end of spending the evening with a lot of the time,” explained public communication junior Greta Gustafson. “Mark your calendar for the dates because if you forget to pay the rent, some apartments will really kick you out in the literal sense. One of my neighbor’s stuff—his furniture, clothes, everything—ended up on the street because he didn’t pay his rent,” Khamidova said.